The Kentucky Physicians Leadership Institute (KPLI) has been announced as the recipient of the A.O. Sullivan Award for Excellence in Education. The award will be presented on Oct. 30 during the twelfth annual MediStar Awards, to be held at the Muhammad Ali Center. The MediStar Awards honor healthcare professionals for their achievements in advocacy, innovation, education, leadership and aging, as well as announce the Physician and Nurse of the Year. The A.O. Sullivan Award is presented to the organization that takes creative approaches to developing and implementing programs, which enhance the level of knowledge, education and career opportunity in healthcare. KPLI is the premier leadership training program for physicians in Kentucky. Each year, the exclusive program selects up to 15 physicians to participate in a year-long series of learning events that will cultivate the next generation of physician leaders across the state. The four primary events, culminating in the KMA Leadership Academy, help address many of the challenges facing the physician community. KPLI is funded through a grant from The Physicians Foundation and by the KMA’s education and charitable arm, the Kentucky Foundation for Medical Care. Nineteen physicians have completed the program since its inception in 2016. “I have been using what I have learned (from KPLI) on an almost daily basis. Thank you for the opportunity to further my career development,” said Michael Kuduk, M.D., a pediatrician from Winchester and a 2018 KPLI graduate. The 2018 MediStar Awards will also honor three KMA member physicians for their contributions to healthcare. Sarah Moyer, M.D., and Bryan Loy, M.D., will be presented with The Centerstone Healthcare Advocacy Award, which recognizes an individual that has worked to raise awareness of health challenges in the region and worked to affect change. Sandra Shuffett, M.D., a Nicholasville radiologist with Baptist Health Medical Group, will be presented with The Dean Dorton Physician of the Year Award. This award is given to a physician who has shown outstanding leadership and vision and has contributed to their workplace, leaving a lasting legacy. Shuffett is a 2017 graduate of KMA’s Community Connector Leadership Program, and is a member of the University of Kentucky Board of Trustees and the Kentucky Board of Medical Licensure. She has been a vocal advocate for women’s health, and earlier this year secured a grant from the KFMC that will provide female University of Kentucky faculty with access to health programs combating chronic struggles such as obesity and smoking. 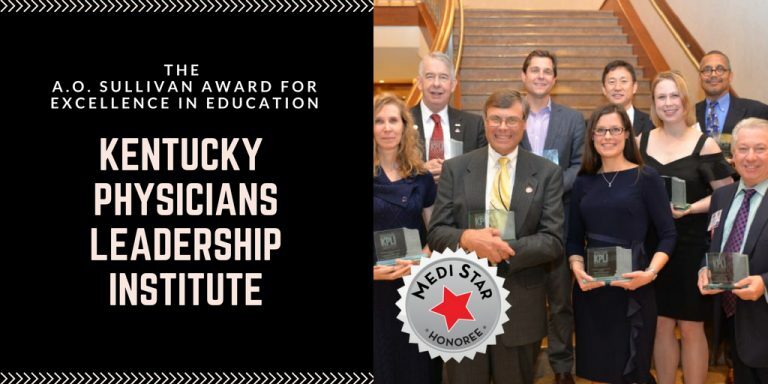 In total, KMA members and its KPLI program make up four of the seven 2018 MediStar honorees. More information on the MediStar Awards is available at https://www.medistarawards.com/.